A new type of hard drive promises to revolutionize our interactions with computers in the very near future. The revolution is so dramatic, so different from what we are used to, that anyone who uses a computer is going to benefit in a profound way. The biggest bottleneck in your computer right now is the hard drive. It’s the only part of your computer that remembers anything when you turn it off, so it’s kind of important, and unsurprisingly its something we use and rely on a lot. That’s why most of us have had a painful experience with them in the past. Well the good news is that a new type of hard drive promises to not only make them more reliable, but much much faster. So much faster in fact that a speed revolution in our interactions with computers is about to take place in 2010 and 2011. The problem with existing hard drives is that they are prone to failure. This is because they are mechanical. Spinning inside your computer as we speak, at 120 revolutions per second, is several very thin magnetic disks a little smaller than a CD. Hovering a millionth of an inch away from each disk (actual figure) is a small pickup head, that should it ever touch the disk its allied with, will lead to complete failure of the hard drive and likely total loss of data. Something to think about the next time you feel like shaking your computer. It’s actually a miracle these disks don’t fail more often. Fortunately the miracles of modern engineering mean that they are actually quite resilient. Technically they shouldn’t stand a chance but they do. The point about these drives is that they are the library the computer turns to hundreds of times per second and they do so mechanically. Because the device is mechanical, there is an upper limit to how fast the data can be accessed or written. There is only so fast you can spin the disk and move the tiny little head across the disk. Far quicker is something that has no moving parts, and which works at the speed of light – memory chips. In the past the problem with memory chips was that they were relatively expensive compared to hard disks. The price per GB for chips has and still is much higher than an equivalent hard disk, so it was unrealistic to think we could store all our programs, photos and music files on chips. That’s why we didn’t. But the never ending march of capacity means that memory chips the size of hard disks from just 3 or 4 years ago are now quite affordable. And since our fundamental storage needs have not increased that much in the same period, it is now realistic to consider putting some or even all of our data on chips. So called Solid State Disks (disks made out of chips) started appearing around a year ago. The initial offerings were extremely expensive and actually no quicker than the hard disks they were supposed to replace. They offered almost no reason to upgrade and were simply a toy for early adopters. That situation is now changing and a single product from a previously little known company has revolutionized the industry. A company called OCZ has blown away the competition, reviewers and bloggers that track this nascent industry. A typical hard drive has an average transfer rate of 30 megabytes per second. The OCZ Vortex has a throughput of 250 megabytes per second. This is nothing short of phenomenal, and the price is within the reach of many people – an entry level 30GB solid state disk from OCZ costs £90 ($140). Now a 30 GB drive may seem tiny in comparison to the 1500 GB (1.5TB) mechanical drives that are available for the same price. But who really needs 1500 GB? The vast majority of people use far less than this. The capacity of hard disks has simply run away from most people’s needs. Bad news for the mechanical disk companies, good news for consumers. If you run a standard home computer, have installed maybe half a dozen programs, have a medium sized music and photo collection, and are not storing your home videos on your computer, chances are you are using no more than 30 GB on your disk right now. Maybe its 50, maybe its 75. The point is you are not far away from legitimately being able to consider a Solid State Disk to replace your mechanical one. You might even be able to do so now. If I tell you that installing one of these OCZ drives would instantly make your computer feel 8x faster – bootup of Windows or Mac OS X in under 10 seconds, opening Microsoft Word in the blink of an eye, all for maybe $140. Would that not sound appealing? Such nirvana is actually available right now if you are comfortable with swapping in a new hard drive into your computer. Simply go and buy one of these disks and install it. To a computer they look exactly like the mechanical hard disk they are replacing and have the same dimensions and connections. For most people, this speed revolution will come the next time they buy a new computer, assuming that is you are buying a computer in 2010 or 2011. Solid State Disks are available in brand new computers now, but typically as a build-to-order option that is over priced. In all cases (as of the time of writing in July 2009) they are poor performing 1st generation models. The OCZ Vertex is firmly a 2nd generation model. I would suggest that if you are a hobbyist or your time is particularly valuable, now is the time to dip your toe into the water with SSD’s and specifically the OCZ Vertex or its emerging cousin the OCZ Summit. You don’t need to move everything over to Solid State Disks right away. You can create a boot drive containing your system software and programs on the solid state disk, and keep all your document files, music and photos on a traditional disk. You’ll still get a huge speed benefit and still have lots of space for those large music or video files. If you like the idea of rolling your own solid state disk, you can actually buy an enclosure that lets you put your own memory chips into it. I’m personally holding out just a little bit longer. My core storage needs (system and programs) are a little higher at around 75gb, and once those start coming in at the same price as the 30gb, I’m going to make the jump. Note that the OCZ Vertex also comes in capacities of 60gb, 120 and 250gb, but these are just a bit too expensive for my money. While OCZ have definitely shaken up the market, Intel is also producing high performance SSD drives (although more expensive) and I can’t imagine the likes of Samsung and SanDisk are going to sit by and let these two companies show them up for very long. One interesting aside is that going beyond 300 MB per second is not currently possible due to the speed of the SATA or eSATA interface that connects these disks to your computer. 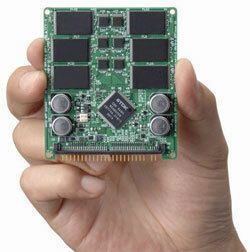 A new SATA specification of 600MB per second (6Gbps) is coming, but who knows how long that will take. Another good reason to take the plunge into SSD’s soon…. One issue I’ve learned about SSD’s since writing the post is a degradation of speed performance over time. This can be fixed though with special garbage collection algorithms and here again OCZ are leading the way. This will thus be a short-lived issue and can be fixed on older SSD drives by updating the firmware.